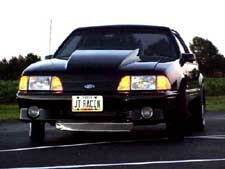 This website has grown far beyond my original intentions of helping the shadetree mechanic in understanding a drag racing suspension in simple terms and diagrams. Initially I wrote this page as a detailed explaination of a Drag Car Suspension using explainations that the do-it-your-selfer can easily understand and do in the driveway with average tools, pencil and paper, etc. Things have changed over the years since this site was published. By the photos on this site you can see the variety of racers that have benifited from the info in this page and for this reason I am updating this site with some explainations that will be different than originally written. There is also information that I still have not gone into due to the complexity of writing it down or creating the diagrams and my goal for this site is to keep this information as simple as possible. I commonly read on bullitin boards that this site is Only for stock suspension cars or Only for tube chassis cars but in fact the info below is for both types of vehicles. Whether the car is a stock suspension car running 13's down to 7's or a full tube chassis car running 13's down to 7's this info can be used successfully. A stock suspension car that uses 4 trailing arms is a true 4-link and can be treated, plotted, etc, as a true 4-link car so the savy racer looking for an edge can benifit from this information. There are sections below that do separate the different ideas for a Stock Suspension car vs a True 4-link car and the reasoning will be explained below. Here is how I learned to think about launching a car. Imagine pushing on a refrigerator on a tile floor. Your feet are representing the tires on your car. The Center of Gravity (CG) of the refrigerator is imagined to be in the very MIDDLE on one of the shelves. If you were to push on the refrigerator somewhere above the CG then you will probably push it over (the refrigerator won't move) and you won't feel much pressure on your feet. Now, if you push on the refrigerator 2" from the ground, you will slip on the ground (not getting traction) and the refrigerator won't move. If you push on one side of it then it will turn and not go straight. But somewhere in between the CG and the ground will be the "sweet spot" where you will get the most traction and the refrigerator will move the easiest. When changing the suspension, what you are looking for is the Least amount of power to move the car the quickest. This is Efficiency. Imagine the weight of your car concentrated in an area the size of your fist and located, for example, on top of your shifter handle. The actual position will need to be calculated but this is just for a visual aid. Ladder Bar- The IC is the front ladder bar mounting hole. Four-Link- The upper and lower bars are angled toward each other. The IC is the imaginary point of intersection if you were to draw a line along the length of the lower and upper control arms forward. Percentage of Rise (PR) is best used for ladder bar cars but a few do use it for 4-link cars. Imagine a line drawn down to the ground from the Center of Gravity (CG) like your shifter handle in the example above. Now draw a line forward from the contact patch of the rear tire through the line from the CG (the line should be drawn so it is below the CG). This intersection is the PR. Getting back to the CG. Let's say the CG is 26" above the ground, for example, sitting on top of your shifter handle. This 26" is represented as 100% and 13" (halfway up from the floor) is represented as 50%. When you found the PR (when you drew the imaginary line from the contact patch through the virtical line from the CG) it intersected it at, let's say 18" from the ground. Then the suspension is said to have a PR of 69% (18" / 26" = 69 or 69%). Generally, cars equipped with automatic transmissions need a PR greater than 50%. Cars equipped with manual transmissions need a PR less than 50%. The HIGHER the PR the HARDER the suspension Hits the tires. The LOWER the PR the SOFTER the suspension Hits the tires. Manual transmission cars already hit the tires plenty hard when the clutch is dropped so need very little PR compared to an automatic equipped car. By comparison, automatic cars (no T-brake) don't hit the tires hard at all. *See Anti Squat below in the 4-Link section for another term used for describing how to set up a 4-Link chassis. The goal of the front shocks is to control the rise and fall of the front end. The most efficient launch is when the front end rises slowly and settles down slowly while the car is still accelerating. The rate that the shocks extend and collapse is dependent on many factors: Tire size, rear gear ratio, first gear ratio, T-brake, torque converter stall, vehicle weight, horsepower, track conditions, etc. If you were to graph the front bumper during a launch you want a nice even rise and a nice even fall throughout the first 20-60 feet. You don't want the bumper to pop up quickly then fall slowly. you also don't want the bumper to pop up quickly then fall quickly. Fact: Maximum weight transfer occurs when the front shocks are at Maximum extension. If the front end is soft and rises easily then maximum weight transfer happens within the first 2 feet of the launch. Once the shocks are fully extended, the only direction they can go is back down. Once the shocks start collapsing, the rear tires start to unload. What can happen is that the front end will rise quickly and get traction but then the front end starts to settle. With a car that produces a lot of power this will cause the car to hook hard initially for the first 3-5 feet then start to spin the tires while the shocks are collapsing from full extension. If the car does not have enough power to spin the tires then the car just wasted energy on raising the front end instead of pushing the car forward. If the front end is soft and takes little effort to lift the front bumper then the very first reaction during a launch is for the front end to rise instead of the car to move forward. I prefer to have the front end rise as slowly as possible. This means that any available energy is directed toward making the car move forward instead of up. If the car is moving up, then it is not moving forward which slows down the 60' time. There can be a fine line where the front end does not rise quick enough and can slow down the 60' times because it is working the engine too hard and doesn't allow the engine to rev quick enough. This is where adjustable shocks help. Here is an example that will help explain how the front shocks and the rear tires react to each other. Imagine standing on a bathroom scale and holding one end of a 12 foot long board. The other end is being supported by a friend. Your feet represent the rear tires and your friend represents the front springs/shocks. -Try lifting the board out of your friends hands from your end of the board. With no help from your friend the board will feel very heavy and as you try to lift the board, you will apply pressure to the bathroom scale. This is similar to the reaction that the tires will feel with stiff rebounding front shocks. Engine size is 308ci. The engine is a single 4 barrel, flat tappet camshaft, with steel heads. It runs a turbo 400 transbraked, vehicle is making approximatly 620/630hp. The car has only made several passes, but is currently the quickest in their class, besting a present a 9.80 @ 137. It 60 foots in 1.33. Here is where things are different from a Stock Suspension car that uses the stock mounting points for the upper and lower control arms compared to a true 4-link car. Rear springs should be a little stiffer for a drag car but many people think that the car should "squat" during the launch so they install softer rear springs on the car to accomplish this. The only cars that should be squatting during the launch are those cars that shock the tires very hard (4-speed cars) and with enough power where the car will overpower the tires. Prostock cars actually squat during launch because they develop enough torque and hit the tires so hard that the squatting helps absorb some of the shock and keeps from overpowering the tires. But, setting up the car to squat is not a function of the springs. It is the position of the Instant Center (IC) that determines how the car squats. The STOCK mounting points for the control arms already cause the car to squat which can unload the tires. So in order to compensate for this squatting the springs need to be stiff to transfer the force to the tires. If the rear end squats that means that the rear springs/shocks are not pushing the rear tires into the ground. They are just compressing. For the most part you don't want the rear to squat because you want some resistance from the springs/shocks to transfer the force/weight to the tires. Make a coil spring out of a coat hanger and place it on a bathroom scale. Push on the spring. The scale is not going to read much because you are not transferring any force to the scale through the softer spring. Now take the spring out of your car and place it on the scale and do the same thing. The scale will read more pressure because it IS transferring more force through the spring. This theory is different for a 4-link car because the angles of the upper and lower control arms can be changed to eliminate the squatting. For a 4-link car the rear springs should be as soft as possible to help absorb the initial launch. You want a spring to be as soft as you can get without coilbind so it can react quickly during hard launches. A stiffer spring can not react as quick and can unload the tires. Just wanted to let you know that all your info has helped me alot. I have been running a small circuit of 7.0 heads up races on a pro tree. I have the only stock suspension cars and the only one on 10.5 slicks. Most of the cars are big tire 4 link IHRA bracket cars. We have had 5 of our 11 races and I sit 2nd in points and finished 2nd last weekend on a 98 degree day when a lot of cars were having trouble getting down the track. Last night I went to a test and tune and ran a new best of 6.74 with a 1.401 60ft.This is with stock shocks of a very old age stock rear springs with air bags 35 rh and 18 lh, rear set to your ride height, eibech front springs cut way down and stock struts. Car comes out very flat just lifts the tires an inch or two. Without your input I would not be running this well thanks again. The goal in setting up a suspension is to apply just enough force to the tires to keep them from spinning and let the rest of the force push the car forward. Draw an imaginary line through the lower control arm forward. Now draw an imaginary line through the upper control arm forward until it intersects the lower line. This intersection is called the Instant Center (IC). Now imagine the Center of Gravity (CG) of your car concentrated at the shifter handle. Where the IC (Instant Center) is located compared to the CG (Center of Gravity) is what determines how the force of the suspension acts on the car to get it moving. If the IC is too high then there will be too much energy wasted pushing the car skyward. If the IC is too low then there won't be enough force applied to the rear tires and the tires will spin. There are also variables if the IC is in front of the CG or behind the CG. Somewhere there is going to be a position (or more than one) that will apply just enough force to the tires to keep them from spinning and the rest of the force will push the car forward. While the car is sitting still, the tires have 100% traction. During the launch you don't want to change this. Properly adjusting the IC will maintain the existing traction during the initial launch or Tire Shock. The IC starts working during the first .001 second of the launch and continues for the next 30 feet or so. However, after the first .001 seconds the shocks are playing a very important roll in "maintaining" the traction and allowing the IC to apply the desired force to the tires. For the most part, the IC is what is adjusted to get the initial hook and the shocks should be adjusted to maintain the traction throughout the 60'. The four control arms on a four link type suspension, when adjusted correctly for a particular car, can help launch a car quicker and use less horsepower doing it. Compared to a ladder bar suspension a 4 link suspension has the added benifit of changing the length of the Instant Center to accomodate more or less front end lift without adding any more Anti Squat. This is a term used to describe how much the rear of the car will Rise or Squat during launch. If a chassis has 160% of AS then the rear will rise drastically, planting the tires violently. By comparison if a chassis has 100% AS then the rear of the car will not rise or squat and if a chassis has less than 100% the rear of the car will squat. ~A common problem with high horsepower cars running Too Much AS is that the tires will plant the tires very hard for the first several feet but then start to unload the tires and spin when the chassis starts to settle. If your car does this, then look into the value of the AS. Much too often racers will detune the engine to "calm down" the launch instead of look into the suspension geometry. ~A common problem with high horsepower cars running Too Little AS is that the suspension will cause the rear of the car to squat which tries to unload the tires. Again racers detune the engine to maintain traction instead of looking into the suspension geometry. 1. Draw a line up through the center of your front wheel. The location of the IC relative to the CG and the Normal Line (or Neutral line) is what determines what the chassis is going to do. One term used to describe the chassis movement for a 4 link suspension is Anti Squat. An IC that is located ABOVE the Normal Line is said to have more than 100% Anti-Squat. An IC located BELOW the Normal Line is said to have less than 100% Anti Squat. ~4-link settings of 100% Anti Squat should accelerate the car w/o any raising or squatting of the rear of the car. ~4-link settings with MORE than 100% Anti Squat will Raise the rear end and hit the tires HARDER. ~4-link settings with LESS than 100% Anti Squat will cause the rear end to Squat and hit the tires SOFTER. ~IC's that are located IN FRONT of the Center of Gravity (CG) will tend to lift the NOSE of the car. 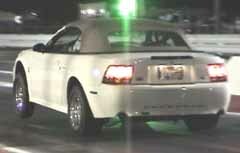 ~IC's that are located BEHIND the Center of Gravity (CG) will tend to lift the REAR of the car. Weight distribution plays a roll on how the Percentage of Rise (PR) is determined and how the front end is set up. If you are setting up a vehicle that is nose heavy, here are some things to try. For ladder bar equipped cars you can raise the IC so that it Shocks the tires harder. Remember that the tires already have 100% traction while sitting still. 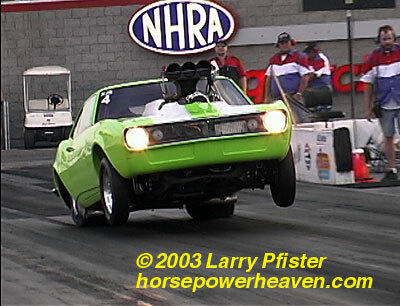 Shocking or Hitting the tires harder will maintain that traction and help get the front end to start lifting. For 4-link equipped cars you can lengthen the IC while still maintaining around 100% AS. Fine tuning the front shocks, either stiffer of softer, can get the best launch. Raising the PR can also slow down the 60' if it needs to be raised too far to get traction. When the PR is raised, the energy is directed towards pushing the front end up instead of forward. If the above doesn't work then increasing the front end travel can have huge benifits. This can allow the PR and AS to remain lower, thus pushing the car forward instead of up and the increased travel will also allow More weight to be transfered to the rear tires. Remember the example of lifting the board noted above? Let's apply that theory to this scenario. With a stiffer (70/30) front shock we are going to have more force applied to the rear tires during the initial launch. But because the nose is so heavy it doesn't want to lift and the rear tires spin too much. Now we use a softer front shock (90/10). This doesn't apply as much force to the rear tires and causes the tires to hook initially but then spin but does allow the front end to rise. The Further the front end rises, the more force is applied to the rear tires and helps those vehicles with poor weight distribution. So the next step is to try a shock valving of 80/20. Lets' say that this works as expected and nets us 100% traction with just the right amount of front end rise but now we have some more tuning to do. If the 80/20 shock works then there may be Un-necessary front end travel. Remember, we don't want front end travel if we don't need it. So now is the time to start limiting the front end travel until only the minimal amount of front end rise is needed. If this achieved with the proper PR then you can be certain that every bit of energy is being used to propel the car Forward which is what we want. *The shock valving used in the above examples were used for simplicity only. In actuality Fully Adjustable shocks would be much better so one can adjust the shocks compression and rebounding characteristics. "Weight Transfer" is a term that is used to mean "shifting" weight to get traction. 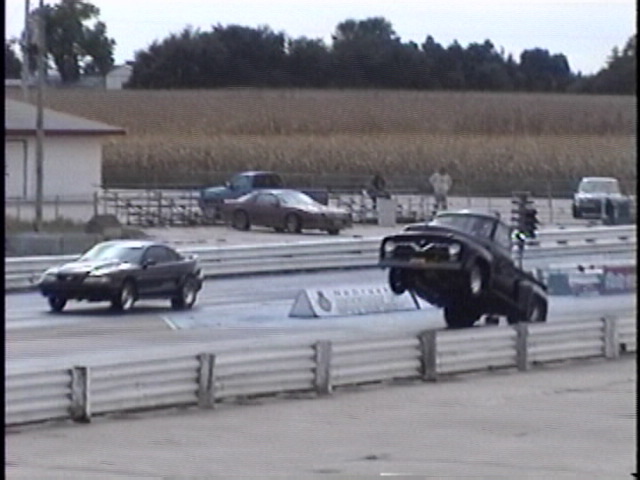 Question: If your car Can Not spin the tires on launch, do you need to Transfer the weight? The reason at this point for transferring weight is NOT to get traction but to allow the front end to rise so the engine can rev quicker and get into its power band. If the car is already in its power band then try limiting the front end travel. There is no need to have any more travel if you already have traction and the car is in the power band during launch. Wheelie bars do more than keep the car from flipping over backwards they can also be tuned to keep just the right amount of force on the rear tires so the car can be accelerated faster. Let's say we have a 3000 lb car that does not have wheelie bars. Keeping this very simple, when the car launches and raises the front tires off the ground then there is 3000 lbs on the rear tires (there can actually be more than 3000 lbs but let's keep this simple). This 3000lbs is the most pressure that can be applied to the tires. 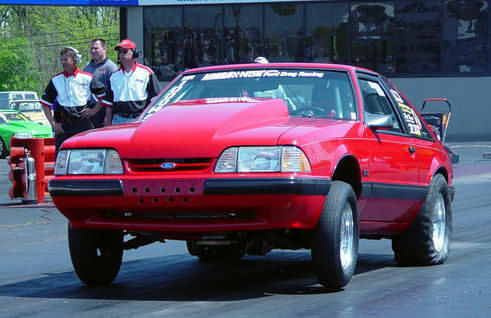 If we add wheelie bars and the car launches hard enough so the car rests on the wheelie bars for a 100 ft then some of the 3000 pounds has to be "shared" by the wheelie bars. So, instead of 3000 lbs on the tires there may now be 2650 lbs on the tires and 350lbs is being "stollen" by the wheelie bars. The amount of weight on the rear tires can change depending on the LENGTH of the wheelie bars. A LONGER wheelie bar will remove LESS weight from the rear tires while a SHORTER wheelie bar removes MORE weight from the rear tires. Depending on the car, switching from a 45" long wheelie bar to a 60" long wheelie bar can keep around 100lbs on the rear tires. So if our car in the above example started with 45" long wheelie bars and we switched to 60" long wheelie bars then we may have went from 2650lbs to 2750lbs of pressure on the rear tires. This can be better than adding an extra 100lbs of weight to the car just to get the car to hook. *The 100 lbs is just an example and can be a lot less or a lot more since it depends on the car and how it launches. A perfect example of increasing front end travel to gain traction on the launches was applied to a 1955 Ford PU. 557ci BBF, 200hp N2O, 5500rpm stall, Powerglide w/T-brake, 4.56's, 15x33 GoodYears, Ladder Bar suspension. *The engine produces approx. 1000 horsepower and launches with the N2O when the T-brake button is released. The weight distribution of a typical 3000 lb car is 1600lbs front and 1400lbs rear. 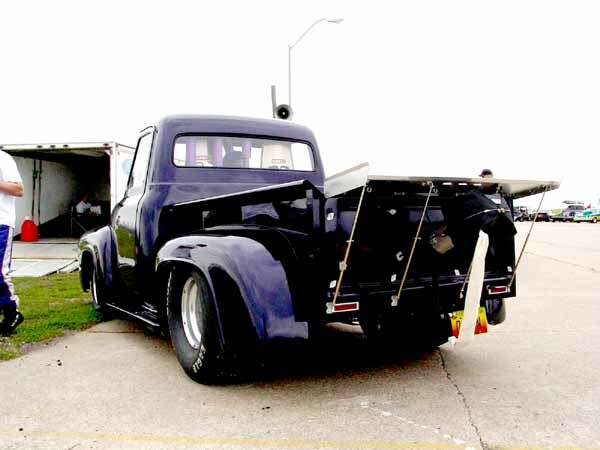 The truck weighed 3620lbs and the weight distribution was 2600lbs front and 900lbs rear! The PR was left at 59% because it already shocked the tires plenty hard with the N2O and T-brake. The decision was to increase shock travel another 4" with new shocks and then relocate the shock mounts inwards towards the control arm pivot point. This gave the truck a total of 18" of front end rise (up from 8") measured at the middle of the front fender. The front shock settings were also set to slow the front end rise so it would not gain too much energy to lift the front end off the ground and to keep the weight applied to the rear tires during the lift. The truck would hook and carry the front tires about 16" off the ground for 40-50 feet just like a ProStock car and then settle the nose back down very slowly with no bounce. The 60' times went from 1.33-1.36 to 1.27.